Good morning! Thanks for all the nice comments on the Charm Pack Cherry Quilt! I had a lot of fun doing it and I'm always excited to participate in a project like that! I loved how they all look so different. Wouldn't it be a fun thing to kit up out of scraps? I like to cut myself kits to work on. Or kits for a gift. I have been working away with Holly.. it's so inspiring to work with her, she has so many ideas bubbling up out of her. Being in a creative environment has really jump-started that creative urge in me. I've finished up cutting all the sashing on my Liberty Road Quilt so as soon as I have time to sit down and sew, I can finish that up. The blocks are so cute! Isn't my new mug a crackup? 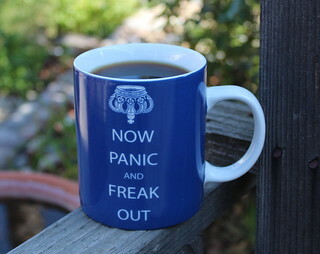 My friend Carrie sent it to me along with a back up Keep Calm and Carry On mug. She totally gets me. Do you follow her on Instagram? She shows works in progress at an alarming rate. sometimes I wish there was a "Love" button to push on your posts! I love that coffee cup and your enthusiasm that I hope comes my way soon! What a great new mug! It would go well with my new bracelet that says, "It's been lovely, but I have to scream now." Ha Ha! The mug is great. I got a good laugh from it. It fits both of us.